“Very positive and insightful event. Well run and structured. 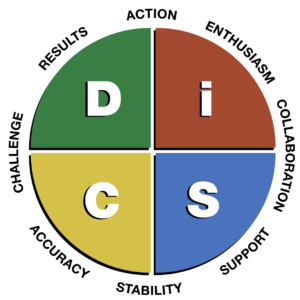 Everything DiSC® is a psychometric personality assessment that measures an individual’s behavioural style. This research-validated model helps individuals to understand themselves and others to be able to build more effective working relationships that are built on an understanding of their different needs, priorities and communication styles. This increased understanding of yourself and others on a team results in saving time, increased energy and engagement, reduced conflict and improved performance. Everything DiSC is used by millions globally each year to improve team performance. This product is being seen as increasingly valuable within the UK Construction Sector Client base – as a required and useful collaboration support tool. Unlike other personality tests, there is no such thing as a perfect or ideal DiSC profile. Everyone is a blend of all four DiSC styles, although you would have a tendency to lean more towards one or two of the four. There is no one profile that is “better” than any other profile. John Wiley & Sons, Inc. one of the world’s largest publishing companies, were the first publisher of a DiSC assessment to use twenty-first century technology adaptive testing to deliver the highest levels of validity, reliability and accuracy ever achieved. All other DISC assessment providers are using some variation of a 24-item, forced-choice questionnaire first developed by John Cleaver in the 1950’s. How is our Everything DiSC® Different from Other DiSC Profiles? Profiles can be printed in sections to allow control over how much information participants receive at any one time. Even the name of the profiles can be relabelled to match the name of the program you are running. “Wiley is committed to maintaining the highest standards of instrument development and application through careful research and development processes. We ensure all of our instruments offer valid scores and accurate feedback to the respondent. Each instrument is designed to provide reasonably accurate interpretations or feedback on your scores”. Everything DiSC is the original, most researched and most transformational DiSC product on the market. Quality, reliability, validity, and results are fundamental qualities that have established Everything DiSC’s credibility and contributed to its continued success in the competitive marketplace. A video short on the Productive Conflict resource. Different people with their different preferences behave differently when in a conflict situation. Our flexible Everything DiSC® applications are designed to help learners better understand themselves AND others. Whether improving working relationships, strengthening management skills, or tackling conflict with a new mindset, Everything DiSC® delivers insights and strategies to meet learners’ needs. Participants learn how to read the styles of the people they manage. With the Everything DiSC Management profile participants will learn how to bring out the best in their employees. The result is managers who adapt their styles to manage more effectively. Everything DiSC Work of Leaders is based on five years of research done by Wiley to identify what successful leaders do. The outcome was that great leaders craft a vision, build alignment for the vision, then champion execution of a plan to achieve the vision. In addition to measuring a leaders DiSC style, the Everything DiSC Work of Leaders Profile measures the degree to which leaders use 18 best practices to turn their visions into reality. Rich, compelling narrative adds depth to the data and strong visuals support the learning process by illustrating key messages with tangible steps toward a desired outcome. Our Everything DiSC profiles come with access to MyEverythingDiSC.com, which is a free online resource for anyone who has taken an Everything DiSC profile. This tool provides participants access to take their profiles out of the classroom into the workplace with practical application. Learn more about your DiSC style and what that means for working with colleagues who have different styles and priorities. Invite colleagues to create Comparison Reports as well as manage invitations received from others. Once your account is set up you can choose how colleagues can search for you whether that be by name, email or nickname and manage your privacy settings and other account information as well!